How did we come to the decision, when just weeks ago we thought we'd keep the mortgage around as an open line of credit when borrowing for a rental home? We were reminded recently with a reality that I haven't shared here on the blog yet: my wife is going to be out of the country for five or six months starting this fall. She's in a PhD program and will need to go abroad to gather the data for her dissertation. It's a bummer. To be honest, we've kind of been in a weird state of denial about it: simultaneously planning for the trip without really talking about it more than necessary. Besides the obvious difficulty in not being able to see each other for a long while, we realized that we didn't have enough time to purchase a rental home before she left. So it would be at least nine months until we could purchase another home, maybe longer, and making our normal payments the mortgage would be paid off by that point. Given that we have that amount sitting in cash earning less than our mortgage interest rate, and there's no way our line of credit would still be around in the event we needed it, we no longer had any reason to wait. After making a couple calls to our latest loan servicing company and our bank, I think we have the process down. We have a payoff amount, the routing information for a wire transfer, and a form to fax in for the wire itself. The funds are being transferred from our "next home" savings account to our checking account on Monday. At that point, I'll oddly have to go to a local Mailboxes Etc. type of business to fax the form...and then wait. I know there are some steps on the loan servicer's end, to process the payment and settle the escrow account and handle some paperwork with the county and probably a lot of other minutia I'm not aware of. But with some luck, we'll have confirmation that we own the home free and clear in the next couple weeks. While the financial benefits are pretty meager, I'm wagering that the psychological benefits will be great. Dave Ramsey keeps telling us that the grass will feel better under our bare feet, and maybe it will. Even if it doesn't, I'm hoping that a debt-free life might involve some more confident risk taking in the workplace and in investing, less worrying about the what-ifs of life, and maybe a bit more happiness, too. Like with everything, who knows what this next stage in life will be like? But we're excited to find out! 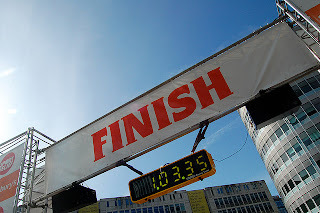 *Finish line photo is from jayneandd at Flickr Creative Commons. Thanks, Kyle. It's encouraging to hear that the juice is worth the squeeze, so to speak. Super duper exciting!!! I am behind on this obviously! Thank you, Cat! I'll take belated congratulations anytime. Hardly anyone read the blog back in July, so no worries!